As marketers, our goal is to grow awareness for brands and we are always on the lookout for the latest content marketing trends and statistics to ensure we are on top of our game. Content marketing is just one of the many ways marketers generate awareness and establish credibility online. As our infographic showcases, users engage more with visual content. Eye-tracking studies show online users pay close attention to information-carrying images. In fact, when the images are relevant, users spend more time looking at the images than they do reading text on the page. 41.5% of marketers said that infographics and other original graphics were most engaging content. 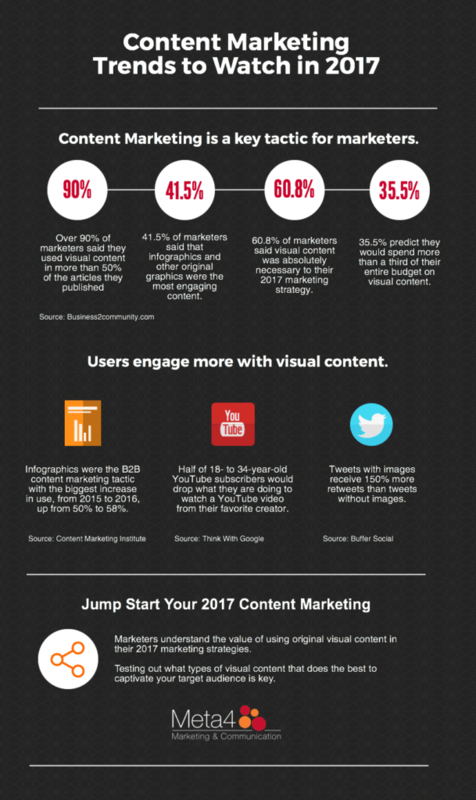 60.8% of marketers said visual content was absolutely necessary to their 2017 marketing strategy. 35.5% predict they would spend more than a third of their entire budget on visual content. Content marketing will continue to thrive as a key tactic for marketers this year and will require brands to think outside the box with their message and delivery strategies. Content will require more time and resources in order to help break through the noise in order to reach your ideal customer. Allocating the proper amount of marketing resources to achieve your goals and objectives must be a key consideration in your content marketing strategy. A constant flow of content is required for quality sales and marketing interactions. Your content you also have a strategic focus and consistent publishing schedule to feed the endless demand for smart content, including blog posts, eBooks, infographics, and much more. The right content marketing strategy can be an effective way to gain the attention of new customers.